In March 1976, the late Dame Anita Roddick founded The Body Shop in Littlehampton – a small seaside town on the South coast of England. Fast forward 34 years to the present day and The Body Shop now boasts the second largest cosmetic franchise in the world. 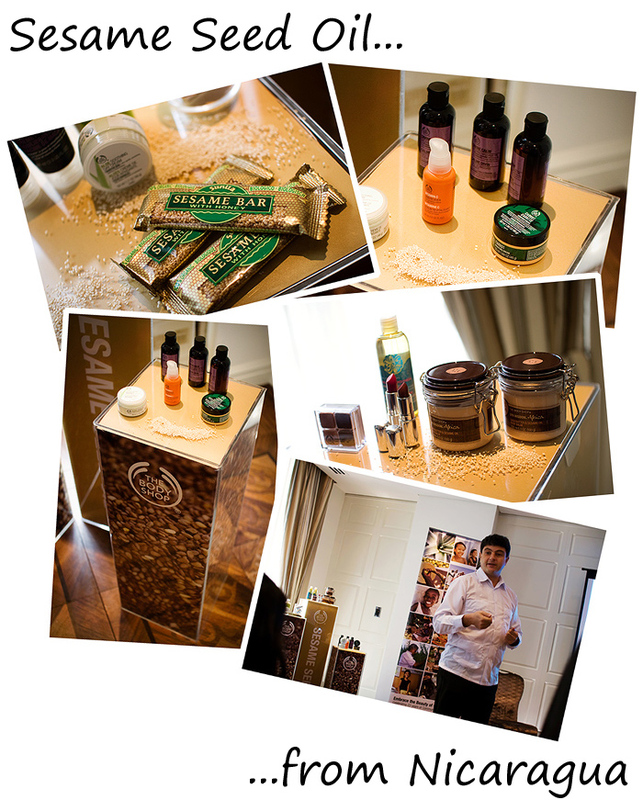 I went along to The Westbury Hotel in Mayfair last week to hear a presentation on behalf of The Body Shop who are currently celebrating 22 years of community trade across the globe. From India to Namibia, Guatemala to Samoa the world is their garden and as a company, they want us to know that they’re taking measures to protect it and the lives it supports. It’s currently Fairtrade Fortnight (22nd Feb – 7th Mar) and The Body Shop were keen to highlight and explain exactly what Community Trade (CT) means and what it involves. 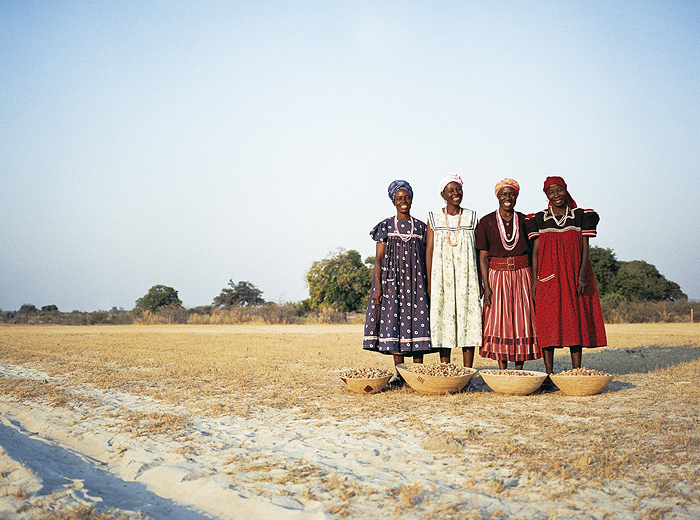 4 of the 6000 women that make up the Eudafano Women’s Cooperative (EWC) in Namibia. The EWC supplies The Body Shop wih Marula Oil (used in nearly all their cosmetics). Community Trade works along the same principles as Fair Trade, but was established back in 1987 before the Fair Trade mark was available or had indeed become fashionable. From what I understood, the main difference is that the foundations of fair trade are laid much deeper in the CT program and work to support the producer’s whole community, not just the producers themselves. The Body Shop also made it clear that they never enter CT relationships for the short term and only commit to sustainable trading relationships that help affect real social change. Two of The Body Shop’s major CT suppliers were in attendance and it was a rare and interesting opportunity to hear how their involvement with The Body Shop affects the communities and co-operatives they represent. It became clear very quickly that the democratic relationship between the ‘industries’ was a precious one to both parties. Whilst I was sitting there, the antagonist in me kept thinking “What do The Body Shop get out of these CT arrangements when it means they have to pay more for their ingredients?”. Thankfully, Christina from The Body Shop didn’t shy away from that subject and explained that it is simply expected of them to uphold the core values that, as a company, they’ve always claimed to represent. Community Trade allows them to continue their commitments to trading with a conscience whilst benefiting from the (often ancient) knowledge of real experts and assured quality products. I’m willing to admit that in the past, I’ve accused The Body Shop products of being overpriced and in comparison to products I can buy in other high street stores, they are. I still may only be able to afford to treat myself to my Olive Glossing Shampoo & Conditioner when I’m feeling flush, but I will now hand over my money with a degree of contentment. It’s good to know that every purchase made contributes to making a real and sustained difference to communities. Communities that without the CT backing by The Body Shop would be powerless to break into global markets or risk plundering by unethical industry. Fair trade is good. Possibly good enough to outweigh my other reservations about this company. Uneasy though. I am curious – did anyone make any comments about the sale of body shop to L’Oréal and what that means re their animal testing policies? How does their “ringfencing” system work and how can consumers be sure their purchases won’t go towards funding animal cruelty? Hmm I’m a bit skeptical about this – particularly the Coconut Oil in Samoa. My dad’s family is Samoan and I visited there last year, and theyre SO poor, so I can only wonder how much support they’re actually getting. Hello! Nope, no comments were made regarding L’oreal’s animal testing policy and how it affects TBS. They reiterated TBS’s 5 core values and emphasised the importance they continue to place on them (one of course being opposed to animal testing). Is it 2013 that all the animal testing loopholes will be closed by further legislation? TBS PR team have been alerted to your questions though, so it’d be great if we got an ‘official’ response on the Body Shop/L’oreal crossovers. Although I appreciate that they’re probably a little too in depth to translate all that well into a blog comments box! That should tell you exactly what kind of support is offered to the communities involved in the Coconut Oil production in Samoa. My late godmother worked with women in Africa when Anita Roddick was just starting up. She used to travel between communities teaching women how to make paper out of the plants in the surrounding area (my godmother was an artist) and came into contact with Anita when she became interested in starting a partnership with some women in order to use their paper for Body Shop packaging. The partnership that came to fruition from their meeting ended up inthose same women and communities being unbelievably exploited by the Body Shop group – while Anita still managed to come off looking amazing because as soon as you mention “working with communities in Africa” everyone immediately assumes that the company is doing good. I’m massively skeptical about this whole presentation – the fact that they even feel the need to publicize the “good” that their work is doing seems suspicious to me – surely it would speak for itself? “As with all our Community Trade producers The Body Shop Community Trade team ensures that the producers receive a fair price for their product. I’ve always been a big supporter of The Body Shop but not really because of their Community Trade involvement, though it’s a plus. I find the products good quality for a decent price and have used them for years. Hullo again – I just came back and caught up with this thread (I was wondering about it as I stood in the shower, heh). Should really turn on notifications. Thanks for asking them for me and for passing on the response. Shame it was just PR fluff, but I do ‘preesh you following up v much. 2013 is when the last exceptions to the EU animal testing rules will cease and it will be entirely illegal to market or sell animal tested products or ingredients in the UK, according to this site. Basically everybody should have been winding down on doing it since 2003 and finding alternatives to it, and 2013 is the absolute deadline for the stragglers. Funny how massive, well funded, powerful companies like L’Oreal, Procter &Gamble, and Johnson & Johnson don’t seem to have gotten round to it yet, isn’t it? Can’t wait til 2013 when I can buy L’Oreal and other animal-testing-at-present brands again. I’ve been boycotting for years now and I miss out on all sorts of Lancome etc goodness as a result.